The most beneficial thing about the Christmas holiday season that I see is the giving it instills in people. It’s great to see people going out of their way to do things for other people and to help with financial and other material gifts. When this giving is from the heart, there is great blessing that follows to both parties — the giver and the receiver. I’m not talking about those who give gifts out of necessity. “Auntie Betty is going to get me a present so I better get her one…” is not the attitude or the type of giving I’m talking about. I’m talking about giving from the heart with no thought of any return. This is genuine giving, the type of giving God can bless. I see both types of giving at Christmas as I’m sure you do also. It’s great to see how much genuine giving is really going on during the holidays. This type of giving seems to be done more out in the community than under the tree. Is that your experience? This type of giving often happens spontaneously when someone sees someone with a need and is there to provide it. 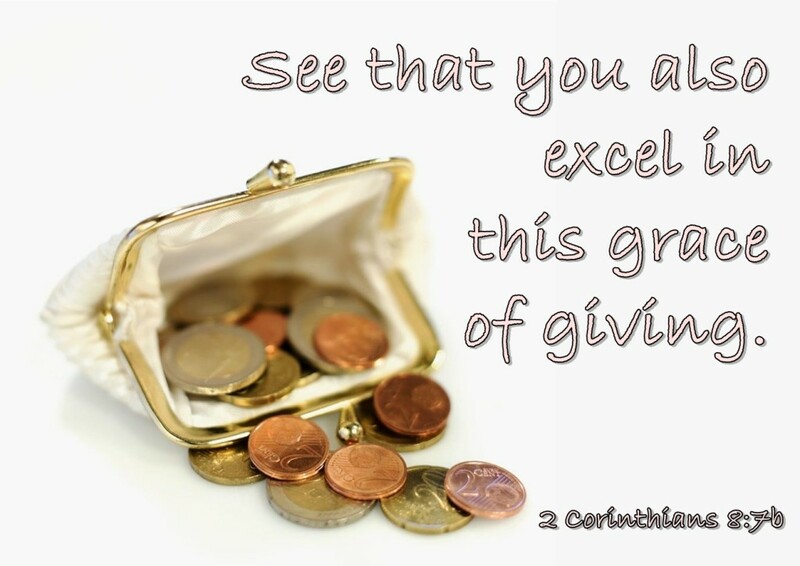 God loves that type of giving! If you were God, wouldn’t you? How do you feel when you give something to someone? I know how I feel, and most of the people I talk to feel the same way. It actually feels good to give something to someone who needs or wants it. It’s a blessing to bless others. When you see their face light up and their burden lifted, even if for a brief time, it brings joy to yourself and the recipient that nothing else compares to. I feel exhilarated when I see the other party thankful. I’m not talking about that horrible feeling when perhaps a spendthrift relative asking to “borrow” money for the 12 time that month… in such cases, it’s hard to lend them money let alone give from the heart because the person is only needy because they can’t discipline themselves to manage their money better. I’ve learned that not giving in these types of situations is better than giving. Each case is different though and may have other contingencies involved. Giving from the heart is a selfless act that benefits a third party. When there is no thought for recompense (being paid back), the act of giving is “from the heart.” Giving with an ulterior motive is not giving at all but more of a form of investment hoping for a return. Let’s see which type of giving God blesses. II Corinthians 9:6-11 Remember this: Whoever sows sparingly will also reap sparingly, and whoever sows generously will also reap generously. Giving genuinely from the heart is a talent that can be learned. Some people seem to be more natural at giving than others, but don’t be too quick to condemn those who don’t give so freely. Giving away what you’ve worked so hard to obtain is not an easy thing to do. Many people suffer from what I call a “lack mentality.” They’ve had so many years of lack in their lives that when they finally get something, they horde it. They are afraid to give because they’ve had so little in their own lives that they feel they have to keep whatever they get for themselves. God helps people get over their lack mentality by promising to supply all their need. It’s because of Jesus’ sacrifice God is able to bless us, and he pours out His blessings to us abundantly. Giving is the trigger, so to speak, that gets the flow going. It’s a principle of life God provided called giving and receiving. There it is, plain and simple, but oh so powerful. Divinely powerful. Spiritually powerful. Give and you shall receive. What could be plainer than that? Believing and acting on this principal will help anyone get over ‘lack mentality’ to produce a giving heart. But the key is giving not to receive but to bless others. Selfless giving opens the door to receiving. Check your own heart when you give to see why you’re giving. If there is any selfishness there, renounce it and give instead from the heart. Develop the heart of giving all year long. Many of us seem to have that heart more around Christmas time when everyone else is buying presents, but how about developing that giving heart all year-round? Needs don’t just surface at Christmas; they are all around us all the time. If you find yourself more in the giving mood around Christmas, try carrying that attitude — that heart of giving — into the rest of the year. See what it does for others and for you in the coming year. Merry Christmas again from The Christian Culture Center and me, Richard Allen Golko. May God bless you abundantly with His riches in Christ Jesus. He has blessed us with every spiritual blessing in Christ already! Praise God! « A Very Merry Christmas to You and Yours!